Time to replace your transformer? GlobeCore / Time to replace your transformer? There are many transformers out there that were installed before 1990. A lot of them are nearing the end of their life cycle and the choice of transformer replacement or renovation is a part of any power distribution company’s strategy of maintaining the grid. Modern oil transformers are not the strongest part of the connection between energy producers and consumers. Transformers have no moving or friction parts, their efficiency of voltage transformation is close to 99%, therefore their life time extends, or rather can be extended well over several decades. At the same time, unexpected transformer damage may bring about significant repair or replacement expenses, especially if the malfunction is sudden and planned shutdown is not an option. Is there a way to prevent this? Is there a way to know if the transformer is on the verge of failing? How do we understand which processes cause this so as to stop them in time? Let’s start with the last question. The modern oil transformers use oil-saturated thermally stable cellulose to conductor insulation, interlayer and inter-windings insulation and insulation of live parts and the ground within the magnetic cycle. Dry degassed cellulose submerged in oil is the most reliable of insulation materials known today. It is, however, also the most vulnerable part of transformer insulation, and has been noted as such before. The April 1920 issue of “The Electric Journal” warned that “moisture and high temperature is the biggest threat to reliable insulation”. Ask a chemical engineer and he/she will call moisture the biggest threat. Ask this same question to an electrical engineer and he/she will reply that high temperature is the only large threat. Both answers are correct. Moisture combined with high temperature destroys insulation. Protection from moisture and overheating is the key to long transformer life. 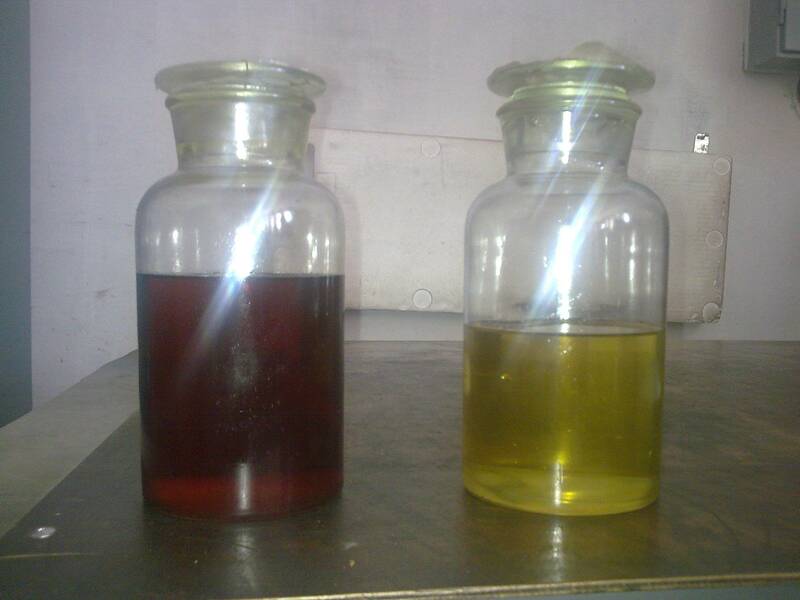 joining with moisture present in transformer oil. Insulation overheating, one the one hand, to a large degree depends on loading of the transformer, being, so to speak, an external threat. Other overheating sources are degraded convective cooling due to decreased oil flow, cause by clogging of the cooling system channels and reduction of radiator cooling capacity, or loss of oil due to a leak. logging of temperature and registration of the highest temperature caused by overloads, as indicated by thermometer. Since in 90% of cases, cellulose decomposition is caused by overheating, it is imperative to check connected loads to prevent new connections and load increase which exceeds the transformer’s nominal power (loading capacity). It has been proved, that temperatures over 140oC caused by overheating, cause gas bubble formation, which in turn decrease insulation dielectric strength, which may lead to short circuiting and premature transformer failure. If you are relying on additional ventilators or oil pumps for cooling to increase transformer thermal resistance, make sure they can limit insulation temperature to protect it from overheating. As far as moisture is concerned, measures to reduce its level are taken as far back as when the transformer is design and built. Engineers and producers must eliminate water accumulation around gaskets around the external transformer case to prevent ingress of moisture through loose gaskets. Oil leaks must be prevented and eliminated with perseverance, since these not only allow oil to escape the transformer and contaminate the environment, but also allow harmful moisture in. This moisture is accumulated in insulation. The same goes for diaphragm of the auxiliary pressure relief device, or, more rarely, for the failure of pressure relief valve to close. Producers must use a combination of thermal and vacuum dring to reduce residual insulation moisture content during transformer assembly. When the transformer is being assembled, insulation is usually exposed to the environment (dew, condensation, precipitation) and may contain up to 10% water by weight, unless it is thoroughly dehydrated. Just 1% moisture content in the insulation paper accelerates the natural aging and wear of insulation by one order of magnitude. It is generally accepted that the acceptable content of water in newly assembled transformer should fall within 0.3% – 1% by weight. Hence the need to use dry heat, about 100oC, along with 1 – 3 torr vacuum to reduce moisture content in the insulation to 1%. What are the signs that the transformer must be replaced? First, if your data indicates that the transformer has been systematically overloaded, it must be replaced with a more powerful one. Continued use of this transformer will lead to damage and malfunction due to overheating, and at the worst possible time, as it goes. If oil sampling and analysis are not yet a part of your servicing schedule, they should be. Start collecting oil samples and analyze them for moisture content. This, along with measurements of impedance or safety factor of insulation, will give you a good indication of its moisture content. 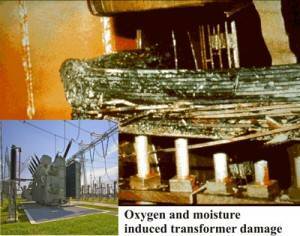 Insulation safety factor of older transformers must not exceed 4% of the initial. The most probable cause of exceeding this threshold is insulation moisture. Second, you should make a habit of regularly running a full DGA (dissolved gas analysis). When cellulose is submerged into an oil tub and is subjected to high temperature, its performance suffers, which leads to formation of water, acids, carbon dioxide and monoxide. The DGA test will identify several gases which may be indicative of existing problems to pay attention to, but CO2 and/or CO indicate overheating and a possible threat for transformer operation. Extending transformer lifetime is the one and only most important strategy of energy related companies. Transformers are expected to be reliable and durable. Twenty or thirty years is a very realistic life time for a transformer. However, if the transformer have been operated incorrectly, including multiple faults, if overloads and leaks have happened before, letting moisture in, its life time can become significantly shorter. Obviously, transformer replacement is a costly affair; still, such replacement may be even more painful if the transformer fails suddenly and replacement requires an expensive unscheduled power cut. Following the simple advice above will guarantee your transformer a long and productive life.